So I know it’s been awhile since you’ve heard from me about my cooking endeavors. Well, the reason is…it has literally been two weeks since we actually cooked dinner at home to eat. Other than the bowls of cereal and peanut butter and jelly sandwiches, that is. It’s been two weeks of non-stop action—school events, baseball games, taxiing to friends’ houses. There’s been barely enough time to actually eat, let alone plan a meal and cook it. Heck, I haven’t been on Pinterest in days! We haven’t even been to the grocery store in almost two weeks either. But rest assured, the almighty Summer Break is upon us and we will finally have more Free Time…or so we hope. But anyway, as I was perusing, I came across a recipe for California rolls…sushi. Now my daughter is a sushi junkie. She loves California rolls and she loves to go out for sushi. I’ll eat sushi, but no one else in the house will even touch the stuff, so her “going out for sushi” rarely happens. I buy it for her at the grocery store, but it’s one of those things that only stays fresh for a day, so she rarely gets the sushi she loves. Anyway, I came across this recipe for sushi and I got a brilliant idea. Why not make our own sushi? Of course, making sushi is not a simple task. (Is anything I do a simple task????) It starts with a sushi making kit which I promptly researched. The sushi making kit consists of a bamboo mat to roll the sushi and a wooden spoon. Oh and chopsticks. That’s it, but apparently it is impossible to make sushi without this bamboo mat. Aforementioned bamboo mat is impossible to clean. Also, every single person’s review on Amazon said you WILL mess up the first few pieces of sushi you make. NO ONE gets it right the first time. Of course, I would have loved to be the first person to get it right on the first try, but you guys know me. The sushi making kit sat on the kitchen table for four days until I had a spare minute for this project. 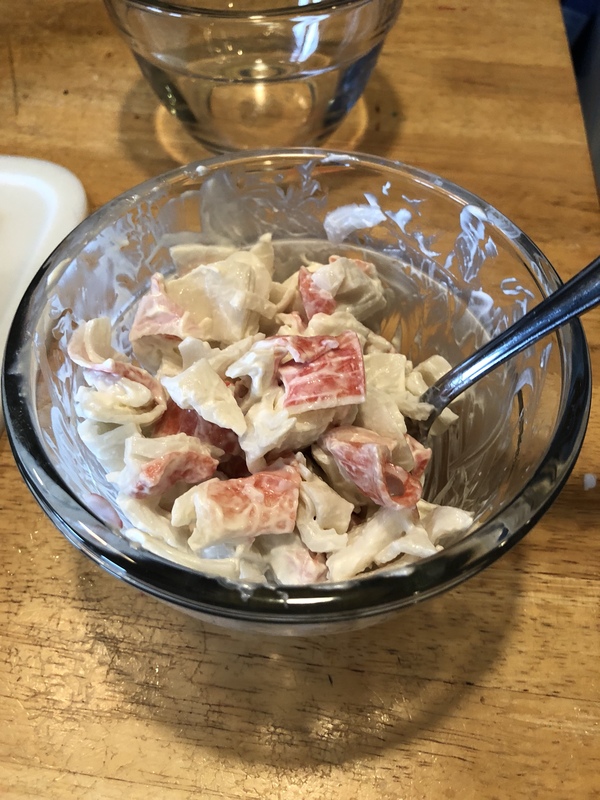 That’s when I sent hubby to the store for cucumbers, avocado, seaweed papers, and imitation crab meat (which he said “you better not sneak into my food”—he hates the idea of imitation crab meat when the real thing is available…and ten times more expensive). The seaweed wrap can be found in the aisle with other Asian foods…no need to go to a special store for it. I did not ask him to pick up sushi rice. 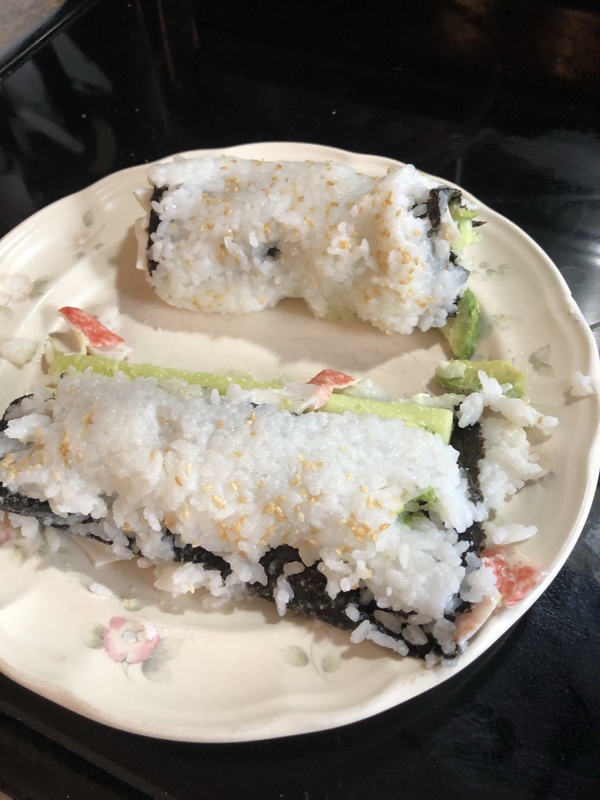 I (wrongly) assumed I could use regular rice to make the sushi, but the recipe specifically called for sushi rice. Back to the store I went… (I proceeded to run into half the town while I was there, thus making the trip about a half hour longer than it needed to be.) When I got home, my daughter had a friend over and they were incredibly enthusiastic about making sushi. They were also enthusiastic about FILMING the sushi making project and posting it on You Tube. Now, most people who know me understand that I hate pictures of myself. What I despise even more is VIDEO of myself. 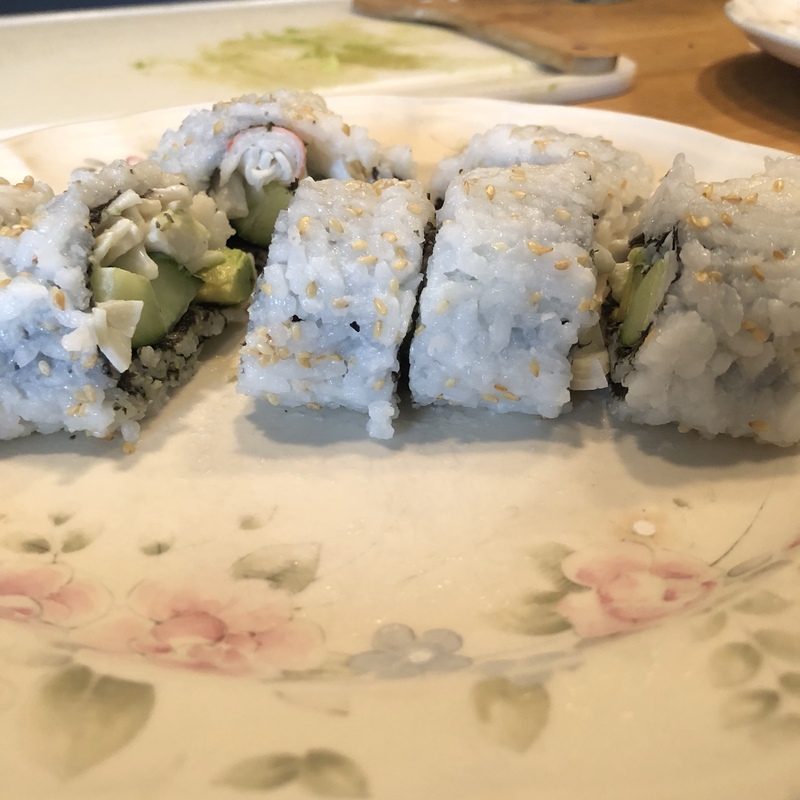 The idea of my sushi disaster being filmed for posterity was a little more than I could bear, but they were so excited about it…how could I say no? Before they got to the rolling of the sushi, though, there was prep work to be done to the ingredients. The rice, first of all, needed to be made. I generally screw up rice left and right, but the sushi rice wasn’t too bad even though it was kind of mushy, but that was helpful later on. You need to mix rice vinegar (1 TBSP) and salt (1/4 tsp) and sugar (1/2 tsp) in a bowl. Once the sugar is dissolved, add to the rice. Stir to mix evenly. Then the crab needed to be chopped and mixed with 2 TBSP of mayo and a tsp of lemon juice. I stuck that in the fridge to chill a little while I peeled and sliced the avocado, and cut and seeded the cucumber. 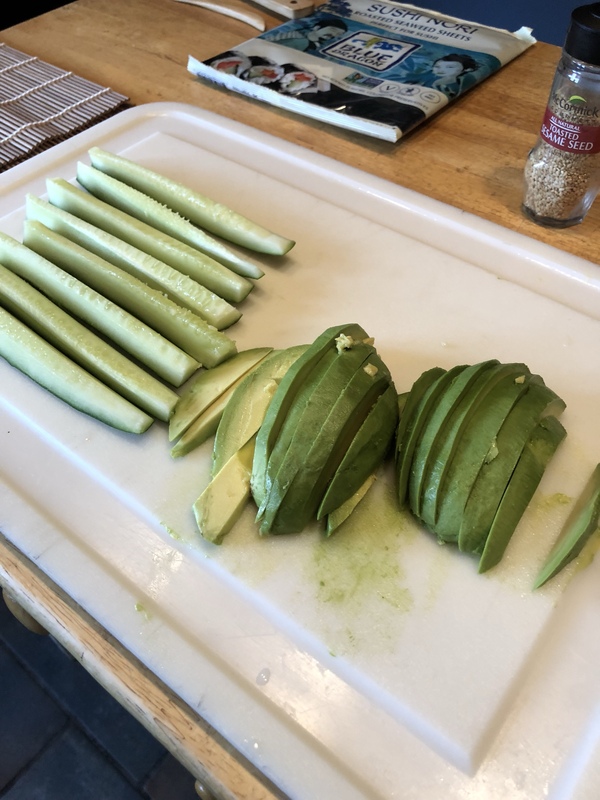 Full disclosure: I have no idea how to actually seed the cucumber, so I just sliced the middle out. I think it was a seedless cucumber anyway. As ready as I’ll ever be, I called the girls to assemble the sushi and roll it. It was at this point in time that I should have popped up to the bathroom to put my contacts in and put a little make-up on and brush my hair, but alas, I was too worried about the impending sushi disaster to think about what I looked like. Hopefully no one will ever watch the video. Chances of that are good considering my daughter still hasn’t edited the video yet. So since I don’t have a video to show you guys, I will have to give step by step instructions. First you lay the bamboo mat down, place a piece of plastic wrap on top of it, and then a piece of the seaweed. You then spread the rice mixture over the top of the seaweed in a thin layer, patting it down with the bamboo spoon. When that is pressed into the seaweed, sprinkle sesame seeds on top and pat those down as well. 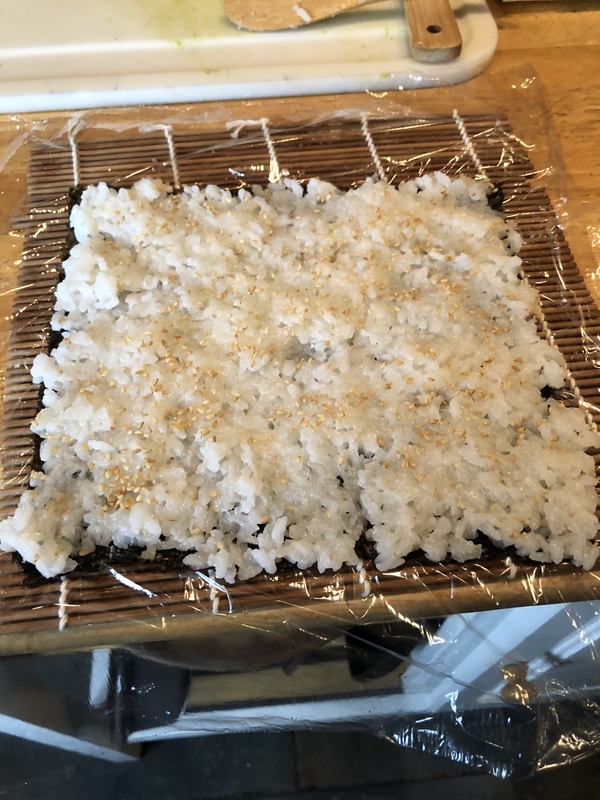 (This is the girls’ sushi…you need to pat it down more than this as we soon learned.) Then you flip the seaweed over (this is the reason the rice needs to be stuck well to the seaweed…otherwise it goes all over). 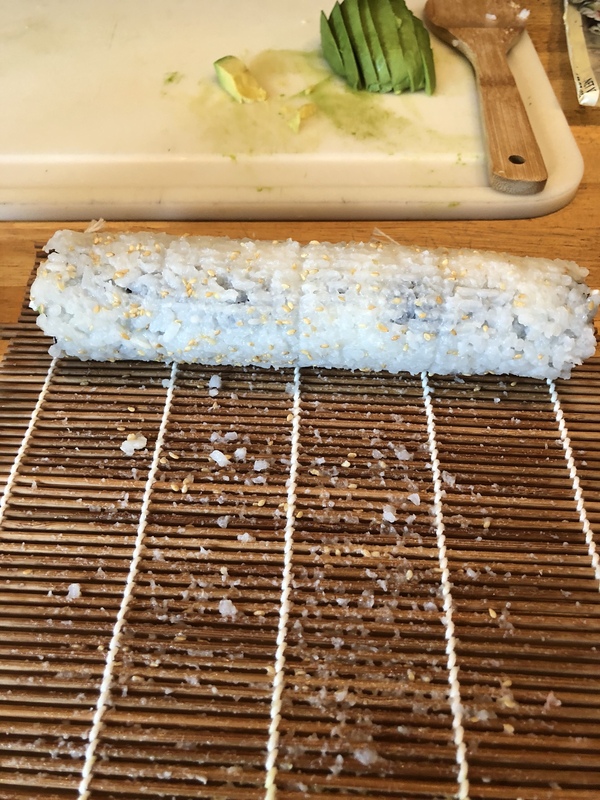 At this point in time we thought we would be clever and put another piece of plastic wrap in order to flip the seaweed—but this just led to the problem of plastic wrap being rolled up INTO the sushi when we rolled up the bamboo mat. So…don’t do that. 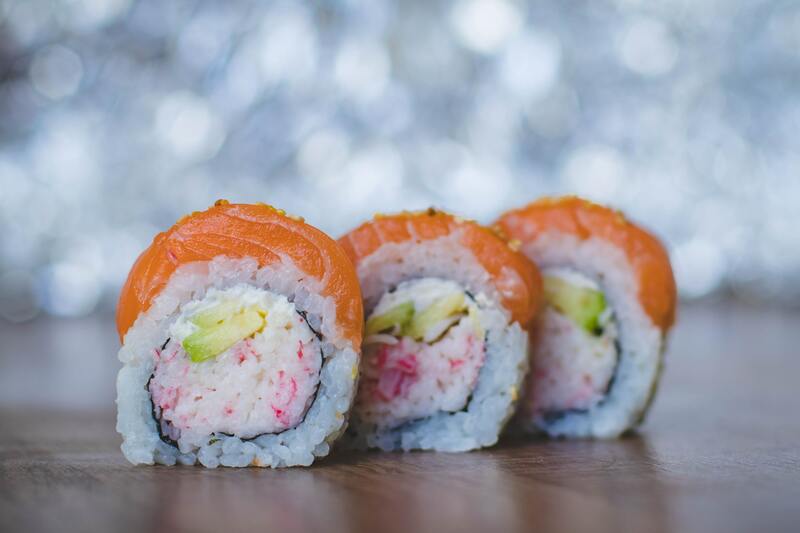 On the empty side of the seaweed, you fill the sushi roll with the ingredients. DO NOT OVERFILL! This is where we also went wrong the first time. 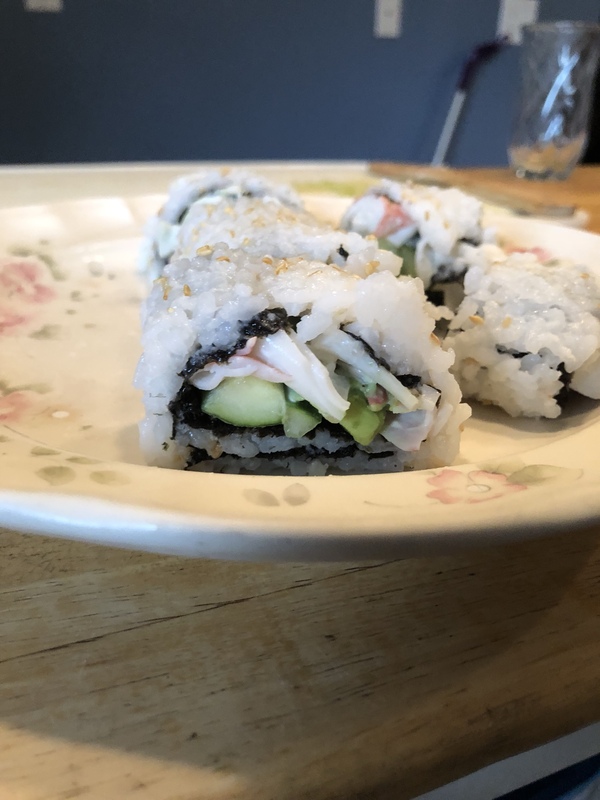 If you overfill, it is really hard to get a tight roll on the sushi and you end up with sushi that looks like this: Yeah…that was the first attempt. Armed with knowledge from our failed first attempt, I tried a second attempt. This was much better, but still could use some work: Because the rice was still warmish, I stuck the roll in the fridge before cutting it. The result was pretty decent tasting sushi—even though it was nowhere near as nice and compact as the sushi we get at restaurants. (Yeah that sushi at the top isn’t mine.) And we had quite a few laughs trying to make the sushi, so I think we’ll keep trying to get it right.